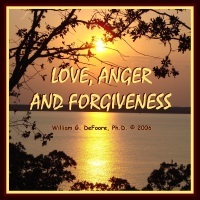 Dr. DeFoore's Healing Anger Newsletter entitled "Holding On And Letting Go"
Holding on is automatic and instinctive. Every child holds on to her mother, her blanket, and her toys. It's all about love and need. The more you love and/or need someone, the more you fear losing them--and so you hold on. Holding on to someone you love can cause you to try to control them. Many times, you're holding on to "who you want them to be," instead of loving them as they are. You may hold on because you're afraid of losing them, and so you want to control their choices, so that they don't leave or threaten your security. Next comes anger. When you're holding onto someone too tight, you'll be watching their every move, and when you see anything that triggers your fear, you're very likely to get angry. Holding on is a closed hand, which too often turns into a fist. "When you truly love someone, you cherish their freedom, and you would never do anything to clip their wings." The challenge of moving from holding on to letting go is a huge one. 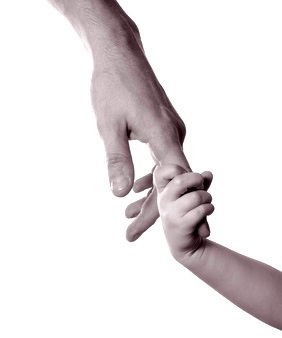 Instinctive fear says, "Never let go," so you're going against some powerful internal forces when you make this shift. So, what's so important about letting go? Well...a lot. Keep reading. At the same time that holding on is instinctive, letting go also connects with a very basic aspect of your nature...love. Your most basic human need is to love and be loved. While fear and anger cause you to hold on too tight too long, genuine love gives you the strength and freedom to let go. Letting go of someone means getting out of their way, not "fixing them" or trying to change them. You have to give up the idea that you know "what's best for them." Letting go of someone honors their freedom and independence as a human being to make their own decisions and their own mistakes. Letting go means you believe in yourself, and your security or peace of mind does not depend on the other person acting or not acting in a certain way. Love is letting go. Love is an open hand of forgiveness, release and respect. This highly effective audio program, available as a CD or MP3 download, will help you understand and navigate the territory of holding on, letting go, forgiving, and improving your love relationships. New web pages for you. Read new contributions from good folks like you, such as Argumentative Partner Who Blames Me And Drinks Too Much by a woman with a nursing background trying to figure out when to let go and move on, and this powerful story by a woman who is just about ready to ask her son to leave their home, called Angry 20 Year Old Son Who Is Abusive To His Father.